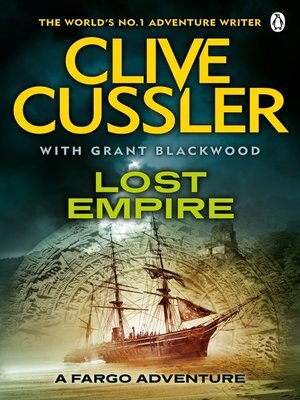 Lost Empire is the second phenomenal FARGO Adventure from international bestseller, Clive Cussler. Some treasures are best left buried . . .
Scuba diving off the Tanzanian coast, husband-and-wife treasure-hunting team, Sam and Remi Fargo discover a huge ship's bell, covered in cryptic carvings. But as they struggle to first recover the bell and then decode its clues, they find they are not alone in wanting to discover its secrets. When news of the find is publicised, Mexican President Quauhtli Garza is forced to act. He knows that this bell comes from a former Confederate ship that sank off the African coast and he fears that the discovery of a missing piece of a Quetzalcoatl statuette, which was aboard the ship, will undermine his plans for Mexico's future. Clive Cussler, author of the celebrated Dirk Pitt novels Arctic Drift and Crescent Dawn, presents the second in the series following the adventures of treasure hunters Sam and Remi Fargo. Lost Empire is the second of the FARGO Adventures; Spartan Gold is the first. The bestselling 'Grandmaster of Adventure', Clive Cussler has thrilled millions of readers with this gripping, fast-paced stories based around treasure-hunting, action and conspiracy. As well as the Fargo series there are also the NUMA and Oregon Files series, the Dirk Pitt stories (which started it all) and the Isaac Bell adventures series. The other titles in the Fargo Adventures series are Spartan Goldand The Kingdom which are both available from Penguin.